Called the Righteous Lord, the Sun God, Bringer of Light, Banisher of Darkness, the Good Spirit, and the Protector. Lathidus's portfolio includes aspects of warmth, light, cleansing, valor, law, eradication of evil, rulership, the sun, justice, judgement, investigation, and truth. Symbol: A many pointed golden sunburst in either two (the "Holy Face of Light") or three dimensions (the "Orb of Radiance"). Sometimes three dimensional versions are crafted as a censer (a "Censer of Truth"). Also, the "Aespertum", a golden ring with a single spoke that widens after exiting the ring like a ray of light, a set of polished weight-scales, a sun bisected by a sword. Home Plane: No, the Realm of Order. Portfolio: Light, cleansing, valor, law, eradication of evil, rulership and obedience, fortitude and integrity, chivalry, the sun, justice, vigilance and diligence, judgement, investigation, honor, and truth. Worshipers: Good aligned leaders and authority figures, law-makers and law-abiders, commoners, and crusaders against evil. Alternate Names: The Righteous Lord, the Sun God, Bringer of Light, Banisher of Darkness, the Good Spirit, the Lord of Law, and the Protector. To dwarves, Lathidus is known as Tholin, the "Temper of Law" (Daernarthor); and Izar, "The Eternal Flame." Elves do not worship Lathidus, though the Lerether name Lathidus as Enærruš, the "Brilliant Light of Man". Drakher address Lathidus as Dutsuk Tuet Bet, the "Burning Destroyer," whom is dreaded and feared. Halflings call Lathidus by the name of Tambanon, the "Careful Father," or Dandrel, the "Bright King." departed from Sulerin (AC12860), Lathidus entered the world and assumed most of the portfolios belonging to Harushta, Solten, and Tennet. Though new, Lathidus has developed a strong following across the world in many human populated lands, such as the Eastern Empire. In these lands, Lathidus upholds the laws of the just and protects the weak. Lathidus strives for a world absent of evil, a world which embodies an orderly peace built on virtuous mortals of goodwill, compassion, and forthright integrity. Lathidus encourages a healthy respect for the rulers of the land by the common folk and demands that rulers be men of honor and good heart, whom their folk can depend upon. By striving to create a world true to the vision of their god, priests of Lathidus hope to manifest heaven upon the mortal world and forever secure it against the evil that creeps from the lower realms. The golden robes worn by high priests represents the shining light of Lathidus living, present, and working to bring the world of Mortals into such harmony with the vision of Lathidus that this world and that of the afterlife are one and the same. Dedicated followers of Lathidus fervently believe in the need to take action against the encroachment of evil in this world. This duty is everyone's, not just the work of a paladin. The common follower is expected to care for the less unfortunate and through kindness turn their hearts to good. Though they do not swing a sword, they are the foundation of a good society and a compassionate heart can defeat evil even more effectively than a sword in many places. It is true too that Lathidus has many paladins and evangelical priests, more than most gods. They travel into the world to develop charity and lead by example. The evangelical and expansionist nature is perhaps the cause of so many different churches and beliefs regarding Lathidus. Some tend more towards nurturing while others do not tolerate even the slightest sign of corruption; as is the case between the Church of the Light and the People's Guard. Some of these schisms in how to pursue the doctrine of Lathidus has caused restrained conflict between some of the more radical followings of Lathidus. It is clear that Lathidus is a dynamic new god, still evolving and emerging into the world. How these various belief systems will hinder or assist the goals of Lathidus is yet to be seen. Many present day followers of Lathidus believe that their god is the unification of three gods, the holy triumvirate of Harushta, a deity of fortitude and temperance whose followers were known far and wide as bastions against the aggression of evil; Solten, deity of discipline and mindfulness which taught the personal evolution of good through meditation on one contribution to universal harmony; and Prolitar, a deity of compassion and charity which taught that servitude and a life of grace were key to promoting good in the world. Since followers from these three ancient gods now worship Lathidus, it is no surprise that there exists minor rifts among Lathidus' followers. The first documented appearance of Lathidus was in the year AC12866 when an avatar appeared to the Patriarch of Harushta, Aebel Cipirius, while he meditated beside the waters of Lake Champion. It is said that a watery spirit that shone like the sun rose up from the lake. It spoke with a divine tongue from its three faces, its voice ringing aloud through the valley. The Patriarch and his retinue humbled themselves before it as it spoke of what was to be in the years to come. Invested with its power, the Cipirius returned to his temple, consulted with the priests there, and displayed divine power to them which had not been seen since the gods had fallen quiet. He showed them the relics which Lathidus had given him; a sword that shone like the sun from within, a scepter of noble craftsmanship that sang a clear note of divine truth, and a cloak of white-gold feathers which bestowed visions of the future to those that wore it. The counsel marveled at the display of divine energy before them and after prayerful consideration they too became followers of Lathidus. Patriarch Cipirius anointed his fellow priests and divine powers were reawakened in them. The temple was then rededicated to their god reborn and from there the teaching of Lathidus spread quickly through the Eastern Empire. Since then, temples of the older gods have been rededicated to the banner of Lathidus and from them go missionaries to spread the word of the gods arrival. Now, Lathidus is a god recognized throughout much of the southern lands of the Irendi Continent, though there is still much work done to spread the faith into the northern lands of Bethdezra, Dazazin, Arend, and beyond. It should come as no surprise that the seat of power is in the great metropolis of Ardent, the capital of the Eastern Empire, where the grand cathedral overlooks the river Rillinon. Great avenues join the high temple of Lathidus to government buildings throughout the city and priests of Lathidus can be seen everywhere. The Eastern Empire has embraced Lathidus as its state religion, though as any visitor to the Eastern Empire knows, there are still plenty of temples to other gods found throughout the land. The Church of the Light has worked hard to spread itself into the lives of citizens. In the wake of the invading Dark God (AC12864) it was the appearance of Lathidus (AC12866) which gave hope to the nation. It's priests were forced to work in secret until the Dark God was finally overthrown, a deed that the Empire largely attributes to the good works and influence of Lathidus. Since then, the Church of the Light has fortified its position in the empire. There are daily worship hours and the sounds of church bells ring out at dawn, noon, and dusk as the devout recite the Prayer of Enlightenment, Prayer of Acceptance, and Prayer of Supplication. Very few towns in the Empire do not have a local temple of Lathidus, or at the very least a visiting priest. Great centers of worship are located in Ergoth, Lyam, Ephesus, Zanour, Larissa, and Cobalt. There is also a large monastery at the shores of Lake Champion, where Lathidus first made itself known to Patriarch Aebel Cipirius. Another monastic sanctuary can be found at Ishen Abbey, where the Arm of Justice trains their zealot warriors. Elsewhere, throughout the southern parts of the Irendi Continent, pockets of spreading Lathidus influence are easily found. Several large temples to various sects of the religion exist in Tel-Akbar and many temples have been built in the United Kingdoms. Of particular note is the immense and relatively new grand cathedral in the city of Minoc, which shows promise of becoming an enduring and prolific center of worship. To the west, priest of Lathidus call the gleaming city of Palentherin home, once a center of worship to the departed god of Prolitar. Travelers of the Four-Fold Plains can find shelter in the great Harushtite Temple of Lathidus in Tarsus. This section details why certain domains fall under the purview of Lathidus. While other domains may occasionally be granted to priests of Lathidus, the below domains are those most commonly found. Priests of Lathidus who belong to certain sects of worship may have additional or fewer choices in what domains they pursue; specific allowances or restrictions are discussed in sections which detail various worshipers of Lathidus. Exorcism: This domain embodies the drive of Lathidus to thwart the plans of evil outsiders who come to Sulerin with malicious intent. Priests of this domain seek out such creatures, prevent them from possessing innocents, and send them back to their infernal planes of origin. A major part of Lathidus' war against evil is the removal of evil outsider influence from the world, so that the powers of good (especially those of Lathidus) can mold the souls of mortals without malign competition. Fewer priests take the Exorcism domain, but those who do are an important part of their gods goals. Glory: Lathidus exalts in the display of worthy deeds, preferring to lead by example and at the forefront of any battle against darkness and evil. The radiant powers of the Glory domain are representative of the powers of light which Lathidus projects into this world. Lathidus is not a deity which hides its power or which works in mysterious ways; priests which select the glory domain do not work in secret, but lead by example at the forefront of their gods battle against evil and undeath. Good: Though some philosophers believe that the gods are without ethics, it is without question that the great majority of Lathidus priests and followers are genuinely good people who selflessly assist others and who dedicate their lives to benevolence and vigilance. Lathidus promotes this facet by granting its priests access to this domain. While some factions of Lathidus adhere more closely to its Lawful aspects, there is no denying that goodness is a major tennet of the faith and this domain reflects some of the most important goals of Lathidus: the protection of others and the opposition of evil. Inquisition: For many branches of Lathidus' faith, it is not enough to combat injustice and evil when it makes itself known. Priests and holy warriors are sent to seek it out and uproot it. To this end, their god provides them with the domain of inquisition. Some branches even employ their powers of inquisition upon their own followers, making sure that the worm of corruption does not taint the faith. Judgement: As a deity of law, it is fitting that priests of Lathidus should be equipped with the divine power to pass judgement. Numerous priests of Lathidus serve as administrators and judges in the legal systems of nations that the faith has spread through-out. Naturally, the judgement of Lathidus is tempered by goodness, but still there comes a time when those who do wrong must atone for their deeds. Law: The Law of Lathidus is intolerant of those who do evil, but it also seeks to spread compassion through the display of mercy. It is a system that strives to rehabilitate those who have fallen astray, not an oppressive system of tyranny and despotic will. The law promoted by Lathidus is guided by principles of justice and it is structured to provide guidelines promoting a wholesome, benevolent, and organized lifestyle. Missionary: As is the nature of all gods, the expansion of Lathidus influence across the world is an important priestly duty. The tools to assist in conversion of followers, by subjugation or persuasion, are provided by this domain and are frequently taken by priests who endeavor to live their lives in lands where the influence of Lathidus is sparse or under attack by other beliefs. Some priests who specialize in Missionary also find it useful to take the Law, Rulership, or Protection domains, depending on their disposition. Protection: Lathidus does not only seek to smite evil, but to nurture and protect those who work for the powers of good. Lathidus extends this protection to those who cannot protect themselves in hope that by such action that the seed of goodness will be planted within them and that they will become allies of the faith. Rulership: Priests of Lathidus see themselves as leaders whose duty is to change the world and bring it closer to the heaven envisioned by their god. To this end, many of them pursue leadership rolls in the community and use their charisma to guide the actions of the fold. The rule of Lathidus is not iron-fisted, it prefers diplomacy and conversion before subjugation. Still, their god provides them with the tools necessary to forcibly bend the spirits of others when there is no other way. Summoning: As with other gods, priests who take this domain focus upon the bringing of their gods servitors who dwell in the Realms of the Afterlife (the Outer Planes) to the mortal world. Through contact with these beings they believe that they can thus be closer to the will of Lathidus. Beings that are summoned by priests of Lathidus tend to have one or more traits which reveal them to be servants of good: they radiate an aura of cleanliness and purity, their flesh is wholesome and unblemished, their eyes and body may radiate light, the halo of a crown may rest over their brow, they speak with peaceful authority, a ray of sunlight falls upon them from the heavens and shadows may shirk away from their presence. Sun: As the God of Light, it is right that Lathidus grant the powers of the sun to its followers and command them to go into the world and demonstrate their faith so that they are bright beacons of goodness even in the most dark pits of evil. The powers of the sun domain grants priests of Lathidus a highly symbolic and effective means of combating creatures which dwell in darkness or who are filled with vile evil. War: Those indoctrinated in the faith of Lathidus know that a perpetual war exists in the heavens, where good and evil vie for the souls of men. They realize that the focus of this conflict is centered here, in the worlds of mortals, and that it is mortals who will decide the ultimate outcome. Thus, their faith encourages those who are able to crusade in direct battle against the minions of evil in any venue; whether that be in the courts of a king, in charitable works, in single combat, or in the fielding of holy armies against lands overcome with corruption. This section provides an overview of the beliefs of significant branches and sects of worship dedicated to Lathidus. Further details of each of these branches follows below. Each branch of worship represents a large body of worshipers who pursue a particular doctrine and set of beliefs from their god; each is a separate institution. Despite being a relatively new faith, the roots of Lathidus are borne out of distinct ancient religions. This has brought about a number of different interpretations of doctrine and theology and led to the creation of several sects of believers who do not acknowledge the Church of the Light to be the right path of worship. Lathidus is silent on the issue of these independent faiths, neither encouraging nor discouraging them. The Church of the Light: This is the largest and most influential body of Lathidus worshipers. The Church of the Light is based in the Eastern Empire. They are a benevolent and evangelical tradition that seeks to spread goodwill and compassion throughout the Empire and the world. They believe in the unification of communities and in the unification of Lathidus' worshipers. As a result they often step on the toes of other sects of worshipers. Though the Church of the Light maintains no military branch, its high influence in government circles allows it to use those resources to combat evil just the same. Of all of the sects, the Church of the Light is perhaps the most "moderate" and appealing to the average worshiper. Many members of the other sects were originally recruited from the Church of the Light. The Arm of Justice: This tightly organized, militant group of zealots prefers to lay evil to rest, permanently and preferably by the sword. The Arm of Justice does not seek to convert evil being to goodness, rather their attitude is best summed by the phrase, "let Lathidus sort them out." Fortunately, the Arm of Justice focuses its sights upon truly evil and corrupt beings for which there really is little hope of redemption. Still, woe to a crooked merchant that tries to cheat an Arm of Justice crusader. Many members of the Arm of Justice are paladins and combat oriented clerics. The Golden Order: A select group of paladins and warrior priests who, unlike the Arm of Justice, believe in conversion by example rather than by the sword. They can be found working together in small groups in some of the most dismal and corrupt parts of the world, fomenting resistance movements against tyrannical leaders, protecting the innocent, and leading strikes against bastions of evil. Not all members of the Golden Order are capable warriors, but all of them are willing to put themselves in harms way in order to change the world for the better. The Watchers of the Deep: The duty of the Deep Watchers is to travel into lands of darkness, often underground, and bring light and the word of Lathidus to the races who dwell there. They are a highly evangelical branch of loosely organized individuals who work to foster goodness in a place that the sun is never seen. Most Deep Watchers are survivalists, by necessity, who carry an unswerving dedication to their god and cause. They are often called to be both diplomats and swordsmen. They are highly regarded by the other sects of Lathidus worshipers. The People's Guard: The People's Guard is unloved by the common folk. They are the kind of nosy inquisitors who unearth the dirty secrets that most people would rather have forgotten. They believe that the general populace is basically unwilling or too lazy to do anything to combat evil. Therefore, they take it upon themselves to intervene in people's lives and guide them to goodness by example. They pursue this goal with zeal, often butting into arguments and minor conflicts to make sure that the just and good solution is advanced. The People's Guard faces the problem of righting wrongs in a world that often doesn't want their help, yet which desperately needs it. The Spiritsingers: These spiritual bards wander the land in pursuit of their ancient tradition. They are lore keepers who make sure that good works are not forgotten by bringing stories of hope to lands that are in turmoil. Many of their beliefs are archaic and come from a time long before the name Lathidus was spoken. As wanderers, they work to unite smaller communities by bringing news from one to another. The Amathan'ter: A secretive, mysterious, and elite group of beings which have been transformed by the infusion of goodness into their very soul. They are incredibly rare individuals, proven time and again to be tireless in their devotion to Lathidus, who possess powers far beyond that of typical priests and who work as the right hand of their god. Legends of the Amathan'ter are pointed to as examples of light and goodness that embody the ultimate goals of Lathidus. Greatest of Lathidus followings, the Church of the Light reigns supreme in the Eastern Empire with the good will of the Emperor. It can also be found throughout the southern lands of the Irendi Continent: the Protectorates of Biengyar, United Kingdoms, Confederacy of Zhakar, and the Westering Kingdoms. The Church of the Light was formally formed in AC12866, when the Patriarch of Harushta united the lesser churches of his faith beneath the emerging power that was Lathidus after encountering a physical manifestation of the god and receiving what is now known as the New Divine Commandment. The traditions of Harushta have a very strong influence over modern worship, extending the reach of church history back many thousands of years. The virtues of order and temperance are still guiding principles of church doctrine; most older priests see their deity's change of name and demeanor to signify a revolutionary change in response to a revolutionary age. With the return of divine powers into the world, following the Great Silence (AC12860-12866) that occurred during the Black Scourge (AC12859-AC12868), Patriarch Cipirius sent out messengers to all corners of his faith, encouraging them to seek prayer with the return of their reborn deity. Meanwhile, other religious leaders had also received visions and new direction. The prayers of Priests of Solten and Prolitar were being answered by what appeared to be a reincarnation of their god as well. In the Eastern Empire, all three religions enjoyed prominence and were familiar with each other. Dialog between the churches quickly revealed that they had been receiving visions from one being, not three separate ones. The foundation of the Church of the Light is the goal of bringing heaven to the world of mortals by leading the common masses into a spiritual revolution. During this revolution all of mortal kind would strive to purify its being and cast out the evil of the world, sealing such vile spirits away or destroying them forever. Since leadership of an orderly society is an axiom of this goal, the Church of the Light seeks passive, but complete, influence over all world governments. Use of these established orders, their extension into ungoverned realms, and their eventual unification of purpose are a key idea within holy texts of Lathidus. Naturally, there is a great deal of dogma regarding morals, civic duty, the perils of evil, and so forth. Worshipers are encouraged to faithfully support their leaders, to harmoniously work together, to reach out to the faithless with compassion, and to guard against incontrovertible forces of evil. More than any other religion, members of the Church of the Light are called by their god to be a light in the world; to lead by being a shining example of virtue. That is how the church views itself, as a beacon of virtue to lead the world into heaven. Priests favored with the ability to channel the power of Lathidus often select the domains of Law, Good, or Glory. Like many other aspects of the Church of the Light, these three domains are said to represent the three-in-one will of Lathidus' three aspects. That most priests can only select two of the three Golden Disciplines is looked upon as representative of mortal imperfection. A priest which has gained access to all three of the domains is held in high regard, even if his official standing within the priesthood is not particularly advanced. Though all priests would like to embody the three greatest domains of Lathidus, there are many who recognize the need for specialists in rulership, evangelism, and martial endeavors. Each of these specialist aspects are said to be descended from the Golden Disciplines, respectively, and therefore they are divinely inspired and right for a priest of Lathidus to pursue. The domains of Rulership, Judgement, and War are called the Three Trials of Kingship. These are priests who are trained to work as important direct agents of kings, such as a viceroy, or who are groomed to become kings. Though few in number, these priests are entrusted by Lathidus to work alongside the rulers of the world and to offer them counsel so that their actions are pleasing to Lathidus. The domains of Missionary, Protection, and Sun are called the Three Lambs of Peace. Priests who dedicate themselves to these principles are called the Illuminated. They work within communities, converting with a gentle hand and tending to the needs of worshipers. The domains of Exorcism, Inquisition, and War are referred to as the Three Swords of Intervention. They are the least commonly chosen domains of the Church of the Light, representing a small, but important number of priests called Tritects, which the church sends to look into internal signs of corruption and into areas of the world which are in dire need of reform by more direct means. Various means of religious expression are encouraged among members in the Church of the Light. Certain colors are considered symbolic. Gold and white are frequently used to represent the light and the purity of Lathidus. Styles of clothing frequently denote ranking within the Church of the Light. A variety of phrases, devices, weapons, and celebrations are all considered to be divinely inspired motions and observances that mortals who are filled with the light of Lathidus will incorporate into their lifestyles. Priests of Lathidus typically wear white robes, hemmed with golden bands. The greater the number of bands, the higher the rank of the worshiper. The Arch-Prelate is the exception to the progression of bands. Though his robes may be fit for a king, they display no bands of rank. This represents how the leader of the church has left behind the ranks of the world, now leading by example and by being, foremost, a servant of his god. A cowl of white is also a frequent part of low ranking worshiper garb, who wear the device as a sign of penitence. Most higher ranking priests only wear the cowl during certain observances where it is symbolically necessary. Naturally, warriors of Lathidus do not go about in robes unless they are visiting a temple sanctuary. Instead, they might wear white enameled breastplates. Bars of gold upon their shoulder, or bands upon their shield are frequently used to denote their standing within the church. Warriors and priests who venerate Lathidus often make use of their gods favorite weapon, the morning star. If they do not, then it is common to at least display such a weapon emblazoned upon shield or etched into one's armor. Many morning stars are fashioned to resemble something like a scepter, thereby capturing the rulership aspect of Lathidus as well. All worshipers of Lathidus typically possess a necklace or some other jewelry upon which showcase golden sunburst or the Orb of Light. These holy symbols of Lathidus are used to ward away evil and are worn as a sign of confidence in one's faith. The golden sunburst is also known as the Holy Face of Light. Many artisans depict a benevolent face within the midst of the sunburst's twenty-seven points, as though Lathidus itself smiled out from the symbol. Each of the twenty-seven points of the golden sunburst represent a virtue of Lathidus. Sometimes they are grouped into three fans of nine points each to represent the three-in-one divinity of Lathidus. Any priest can instantly recite from heart each of the twenty-seven virtues, having had them ingrained into their minds when they began as acolytes when reciting them numerous times served as an atonement for sins against their god. The Orb of Radiance is typically possessed only by priests of mature rank. No acolyte or potentate typically carries it unless it is for a special ceremony. Adventuring priests usually bear a golden chain from which hangs an Orb of Radiance, which they present against forces of evil when they call upon their god. As with many other aspects of worship in the religion of Lathidus in which the holy triad is represented, there are three holy books, referred to as the Holy Tripolite when speaking of the three as a whole. Any church of Lathidus has at least one copy of each of these texts. Each text addresses a different concern of the church. The Book of Annals provides a detailed history of the three faiths before the emergence of Lathidus. It is filled with parable and examples of historical figures who shaped the course of history and who foretold the coming of the three-in-one unification of Lathidus. The second is the Book of Commandments, which acts as a guide to living a righteous life. The many laws of the Lathidus are detailed here, showing worshipers how best to please their god and what actions they should take to lead a full and scriptural life. The third book is called the Book of Prophecy, which speaks of the time to come when the throne of Lathidus will come upon the world and mortals will dwell fully in light, order, and perfect peace. The third book also speaks of the many signs and struggles which will closely predate the Ascension of Light. The head of the Church of the Light is called the Lord Patriarch. Currently this position is occupied by Aebel Cipirius (AC12888), the aged former patriarch of Harushta which first encountered the herald of Lathidus along the shores of Lake Champion. Though quite old, having ninety-four years behind him at this time, Cipirius is said to be gifted with holy longevity and is expected to survive for many more years. The seat of the Church of the Light is located in the Eastern Empire city called Ardent, not far from Lake Champion. Beneath the Lord Patriarch is the Assembly of Auram. The wards of these powerful priests ranges from stewarding large cities to large areas of less densely populated areas. Most of them administrate at least one large city and numerous surrounding towns. All the temples within that area fall beneath the purview of these leaders. The Assembly of Auram is where the vast majority of church law is orchestrated and debated. Among the Assembly there are three Triarchs which represent the interests of the three original faiths. They act as mediators and help the Assembly function smoothly. The position of Triarchs is higher than other members of the Assembly. Triarchs are nominated by the Lord Patriarch and approved by the counsel. A Triarch cannot be promoted to the position of Lord Patriarch, but they are often close confidents and able to sway the Patriarch's decisions. Aurams are also nominated as advisors of kings, where they adopt the title of viceroy. A viceroy often has the ear of the Patriarch since they are in a position to greatly influence the movement of distant kingdoms. The Assembly of Auram nominates Intercessors from the ranks of prestigious priests. The duty of these individuals is to travel from church to church as emissaries of the Assembly of Auram. They watch over the message delivering system of the church and ensure that church laws are maintained throughout the many thousands of miles. Though it is rarely mentioned, since the church does not like to admit its faults exist among its priesthood, the Intercessors duty is also to root out evil and punish priests who abuse the power of their position. Finally, Intercessors are the main means of the church for continuing high level contact with other good religions. Each town, city, and in some cases the individual districts of major cities, have a high priest whose duty is to manage all aspects of the faith within his sphere of influence. These High Priests also hold special gatherings and have the power to affirm new priests into the faith. A typical high priest watches over two to eight churches and their missionary stations. High priests are the middle men of the clergy. They, more than any other level of power within the church, are responsible for promoting the worthy and ensuring that the church functions at a level that most of the public sees. Most of the general populace sees the high priest as their local representative of the Lord Patriarch, even through numerous layers of political power exist between the two positions. To most of the public, the high priest is the ultimate authority of church law and leadership within their area. Each church is run by one or more priests, called Helites (hee lyts), who have been placed into power by their local high priest. These are the priests that most people interact with. They care for the injured, give sermons on holy days, oversee most of the ceremonies that are of interest to the public, and so forth. Most priests are gifted with the holy power of Lathidus and able to invoke divine spells on behalf of the church, thus these are the priests that adventurers are likely to be led to when they approach a temple of Lathidus for assistance. Priests are well educated and have a clear understanding of their gods texts, laws, and needs. They are also in touch with their community on a low enough level that they can work directly with the populace. A priest is also an authoritative member of their local assembly, which convenes quarterly beneath the auspices of their auram. Priests are also allowed to attend the general assembly, which gathers once per year in the city of Ardent. Priests that live distant from Ardent usually make at least one pilgrimage to the general assembly during their lifetime. All priests are encouraged to attend. Priests nominate and often affirm potentates and acolytes, using these low ranking church positions to help administrate and communicate the holy word of Lathidus to the public. Potentates are acolytes who have shown lengthy dedication to the interests of Lathidus, and a suitable moral and ethical code of conduct. They often serve as administrators within the church, hold private worship meetings with a small handful of dedicated followers, answer easy doctrine questions, and sometimes give classes on church history, morals, and ethics. A potentate who serves well is in a position to receive intensive education and indoctrination in preparation for becoming a priest, but less than half potentates continue on to priesthood. Acolytes are often long term members of the church who have shown an interest in becoming part of the church's political system, but who are not quite familiar enough with church. They participate in the set up of most ceremonies and are basically little more than exemplary lay members who have shown an interest in helping the church out. They rarely minister to the public on anything larger than a one-on-one encounter and they are quick to send visitors with questions to better qualified members of the clergy. Most church law comes from one of two sources; originating by interpretation of the Holy Tripolite texts or originating from traditions passed down from the three ancient religions that encompass the foundation of Lathidus' worshipers. The commandments of Lathidus are fairly simple and leave little room for question. They promote an orderly lifestyle and direct worshipers to honor their families and governments. Laws and vows loosely require lay followers to help their neighbors in times of need and to not compromise their immortal souls with acts of selfishness, but give compassionately of their time and resources to the disenfranchised and downtrodden. Minor vows include the utterance of prayers at sun-rise, high noon, and sun-set (though prayers at any time are perfectly acceptable); to observe various celebrations and their related procedure (such as fasting or donning of certain clothing); attendance of services; obedience of church leaders who promote the will of Lathidus; performing proper ablutions upon entering holy sites; and so forth. These minor vows are required of priests and they can expect a reprimand or even censure for violating one of them, but they are less strictly expected to the lay follower. Still, most sincere followers do their best to observe these rules, even if they have not formally made such a vow. Some traditions are assumed to be a part of these minor vows, such as the keeping of a lighted candle throughout the night. Priests are required to take a number of sacred vows. These vows explicitly forbid certain behaviour, such as taking advantage of the trust of lay followers to enact personal gains. They define appropriate procedure for when the death of a creature is sanctioned and when it is not. Sacred vows describe how to appropriately use and care for holy devices. Though not required, many priests take a sacred vow of celibacy in order to better commit their time to their god. They also guide priests of Lathidus in what weaponry is disallowed (poisons and the prescribed weapons of evil deities), their duties to their superiors in the church, requirements for inducting new priests into the faith, as well as severe proscriptions against murder, theft, covetousness, falsehoods, rebellion against legitimate law, and other significant misdeeds that are commonly prohibited by civilized law. Priests which violate these vows can expect swift reprimand from their deity and church in the form of affliction, censure, demotion, loss of divine power, imprisonment, and even exile. Violators of these vows must subject themselves to an atonement before being accepted among the church once again. In the case of priests and higher level leaders, the assembly may send an intercessor to investigate the wrong doing. Lay followers who commit acts such as these and confess their sins are typically commanded to perform some duty to the church as penance and to submit to the local law and its judgement when appropriate. All priests are strictly held to adhere to a number of mortal vows as well. Performing any of the following is a violation of divine commandment commiserate with a mortal vow: blasphemy; manipulation or corruption of holy texts, items, or teachings; sacricide (the killing of ordained followers of Lathidus for any reason); bargaining of one's immortal soul to powers other than Lathidus; and knowingly pledging service to or conducting commerce with powers that oppose the will of Lathidus. Performing such vile deeds leads to excommunication, immolation by fire, and condemnation of the heretic's immortal soul. Priests who do such deeds are certain to attract the attention of Lathidus and experience swift retribution. Atonement is possible, but most offenders are too committed to evil by this point sincerely make such a change in their being. In any case, violating a mortal vow results in the immediate loss of all clerical powers and may also cause the immediate manifestation of a divine curse. Certain branches of the Church of the Light have additional requirements and vows which their members must undertake, such as vows of paladinhood. These specific guidelines are discussed within the details of their respective character classes and prestige classes. In regions where the Church of the Light is deeply integrated into society there is a great deal of interaction between the church and the community. Generally, the Church of the Light is beneficent and is regarded as compassionate and fair by the general populace. It's rules for living are not burdensome and common folk are generally happier in regions where the church has a dominant presence. In larger cities the bells of the church can be heard welcoming in the day, at high noon, and in the evening as they call worshipers to participate in either a brief service or to simply stop where they are an offer a brief prayer to Lathidus. Churches are also sites of social gathering. Good members of the community gather there to coordinate their efforts to assist their fellow man with outreach missions that provide food to the needy and funds to worthy causes in the name of their god. Most churches appoint a ranking member to act as a liaison between the church and the local authority, thus maintaining channels of communication which help the two agencies work together. The church assists in the maintaining of the communities laws, when necessary, and in return receives an opportunity to influence community leaders who are not yet members of the church. Larger churches even supplement guard units of cities with priestly guidance, thus helping ensure that guards act in a just manner, but also assisting the guards with problems brought about by evil beings. Priests can also be often found in courthouses and working alongside the law to make sure that justice is being done. Many churches also provide opportunities for education to the general public. Upper echelons of education typically require payment in money or service, but a general education is provided to all who desire it. Naturally, such education includes significant portions of church doctrine. The church is a benign supporter of sciences which can demonstrate themselves as useful to the church. A well integrated church can also help its members gain apprenticeships with local merchants, professionals, and craftsmen. A well positioned church also keeps records of its many members. Their dates of marriage, deeds of trust, accounting services, records of births and deaths, charts of family trees, and ledgers describing the occupations of its followers. Historical texts and other works of knowledge are also often stored in the chambers of the church. Thus, a church of Lathidus can provide very useful census information to the local government. Not all churches have the resources to provide the above services. On the frontier of the Church of the Light the church often acts as a sanctuary in times of danger. It's leaders may have more authority than the regional government, or the church may be positioned as a missionary outreach that is working hard to convert the local populace to their faith. Such churches may be receiving their funds from a larger church order to assist them in their efforts or they may be operating entirely voluntarily. At a church parish level, relationships with good-aligned, non-Lathidus worshiping churches is typically handled at a higher level. In more densely populated settings, leaders in the Church of the Light realize the benefits of working alongside other good-aligned religions, though such interactions are carefully distanced. Fraternization among priests between religions is heavily scrutinized and romantic relationships between churches are strictly censured. Centers of worship for the Church of the Light are often the focal point of a community; in large cities there may be several such temples, each prominently positioned within the quarter in which they reside. Temples are usually two levels tall so that they can be better seen above neighboring buildings. Angels and saints of Lathidus' heavenly host stand guard at the corners of the building, often displayed with swords at side, doves taking flight from their hand, looking down in compassionate blessing, or holding golden trumpets aloft. Within the temples the great power of the Church of the Light is often displayed with its wealth. Temples are built parallel to East and West, so that the sun rises on the front of the church and shines through the temple windows with its light to shine upon the alter at the back of the church. The sanctuary's vaulted ceilings propel outward the singing of hymns and the sounds of worship to the outside of the building. In the back of the church, behind the alter there is usually a small room for priests to prepare in and which holds items commonly used during services such as blessed water, an Orb of Radiance holy symbol, vestments, and so forth. Two staircases are also in this room. One leading up to a place where the priests can perform their morning rituals at the setting of the sun and the other leading down to a secured room where valuables of the church are kept. The left and right transepts of the temple are used for private meetings and other church functions. In larger cathedrals there are often classrooms and offices spreading outward from the sanctuary of the temple so that from above the temple takes on the appearance of a sunburst. New temples are planned well before the first stone is ever set. In the time preceding there are missionaries appointed to the town or region where the temple is to be built. Their job is to create anticipation and enthusiasm among the common folk, to garner the well wishes of important leaders, and to determine where best to position a temple. As time passes they act as an emissary of the church to reconcile any problems that may arise. They find laborers to begin the work and keep an eye out for members of the community who display willingness and potential to participate in the church. Such missionaries are rarely adventurers, though some may be retired from those more dangerous duties; their new appointment as a missionary to the community does not afford them time to be exploring the countryside and seeking out riches. A typical temple is run by one or two priests, called Helites (hee lyts). Supporting them are three to eight potentates or deacons called, on formal occasions, the Lights of the Clergy. Deacons meet with most visitors of the temple. Some of them possess a minor ability to channel divine power. Deacons also take care of many of the church's functions. They teach early theology classes, arrange church events, and mind the finances and day to day business of the church. For each deacon there are one or two acolytes. These elite lay brethren of the church participate in auxiliary roles for various ceremonies, keep the grounds of the church clean, perform services for the community, encourage fellow members to pursue a deeper commitment to the faith, and handle other light responsibilities. Only the priests of the temple receive steady recompense for their time, but their entire day is given to the work of the church. Deacons often hold other positions within the community, whether they run a business, are a son or daughter of a noble, or conduct some other upright enterprise. Deacons often receive additional fiscal support from the church to fund their churchly projects. Acolytes are usually youthful and they are expected to live a humble lifestyle. They can expect a meal from the church on occasion, admittance to classes provided by the priest or deacons of the church, and free access to the church grounds for their own prayerful concerns. These militant crusaders operate throughout the southeastern corner of the Continent of Irendi, mostly within the Eastern Empire, but to as far west as the United Kingdoms. The careful screening of prospective members and extreme beliefs promoted by the Arm of Justice have limited their growth and popularity. Members of the order do not mind the infamy attached to their name, they do not join the order to become popular or well known; they join the order because they believe that all evil beings should be mercilessly slain. The Arm of Justice is the most brutally militant of Lathidus worshiping branches of faith. In 12869AC a warrior priest named Sir Setivus Van was raised to the position of Intercessor and sent to investigate allegations of corruption in the city of Kider, a modestly sized city based on the harvesting of natural resources and the large military presence which rotates through the Vandros Watch Towers that guard the fiend infested Valley of Death. Sir Van's investigation of the city revealed that numerous members of its leading council were part of a large devil worshiping cult. The city leaders were possessed by beings of evil and engaged in a subtle take over of the area. After nearly a year of investigations Sir Van barely escaped from the city with his life as the Church of the Light demanded his return after being unsatisfied with his performance in the area; lack of firm evidence, the continued reports of corruption, and Sir Van's repeated accusations of treachery against prominent members of the city had worn out the patience of the counsel. Sir Van was instructed to cease investigating the matter and another intercessor was sent to Kider. Setivus disobeyed the church and continued to conduct his investigation from his new post, insisting to any who would listen that the leaders of the city were devils in disguise, and as a result of his breach of orders he was temporarily released of his duties as an intercessor. As the months passed, Setivus claimed that devils haunted his dreams, taunting him for his failure to expose them at Kider. Finally, he gathered together a small group of friends and traveled to Kider. There he met in secret with mid-level military leaders who agreed that their commanders had not been acting ethically for many months. Setivus told them of his findings and they agreed to help him. In the dark of the night they rose up and went from house to house of the city's leadership, conducted brutal but necessary acts to determine who had been corrupted or possessed and who had not, and slew all who bore a taint of the infestation. The devils had been so very careful in their planning. When the night was done, Setivus and his men knew that they had done the right thing, but having slain each of the possessed they had no other proof that their deed was justly done. The senate of the Eastern Empire was enraged at this bloody act and to control the damage to the church's reputation, Setivus and his conspirators were censured and expelled from the church. Setivus continued his vigilant work against the deviltry that had spread from Kider and for his work he and his group of vigilantes were branded as terrorists. Despite this infamy, the group continued to grow as warriors of the church, dissatisfied with how the battle against evil was being fought, continued to seek out Setivus and join his following. In 12873, Setivus formally founded the Arm of Justice. To this day, the Arm of Justice is an extremist group of military minded individuals that see themselves as the sword of their god, sent against evil with but one purpose, to destroy it. Officially they are considered outlaws by the Eastern Empire and their existence is condemned by the Church of the Light. However, the Church of the Light has on occasion found the Arm of Justice to be mutually beneficial and select, highly-placed individuals within the church occasionally pass along information to the Arm of Justice to direct and assist them in doing what they do best: killing evil beings. Most present-day fortified holdings of the Arm of Justice are built and hidden within the hills and forests of the Crescent Mountain valleys. In more civilized lands they operate with a low-profile, conducting their meetings in secret. Many members of the Arm of Justice attend church services held by one of the other larger branches of the faith, in addition to the private services which they hold among themselves. To an one who is not a member of the Arm of Justice, they often appear anything but just. They can appear heavy handed, extremely judgmental, and at times brutally cruel. The Arm of Justice believes that the taint of the lower realms cannot be cleansed from the flesh of the living by any means short of destruction, that beings which dally with infernal powers are truly beyond any form of redemption and that the only way to vanquish evil is through its annihilation. In a world where demonic forces often seek to possess the living, tempt mortals to do evil, and conduct heart-breaking acts of evil which leave terrible emotional scars to taint the lives of the innocent, the Arm of Justice sees opportunity for cleansing fire. It is not the fault of the mortal who has been possessed, but they must be slain even after exorcism lest the seed of evil slowly bud in their hearts or be passed unto future generations. Their spirit, exposed to the burning light of Lathidus will be cleansed and they will be seen for the holy martyr that they are. Likewise, mortals tempted to evil acts must be destroyed for their weak spirits mar the world with their deeds. Mortals who have witnessed awful evils should gird their spirits against hatred, spite, and sin; should they be unable to remove the stain of these evil thoughts from themselves then they are truly better off dead. What may seem brutal is but the grim reality of the heavenly war against the taint of evil. Members of the Arm of Justice believe that most mortals are too timid to face up to the fact that their souls are part of a terrible war. A sacrifice is required of everyone in order for the powers of good to win in the end, even if that sacrifice is martyrdom. The Arm of Justice is not entirely without compassion. Beneficence is reserved for the innocent. Charity is encouraged. Kindness is a virtuous act. A member of the Arm of Justice knows that these are meritorious ways to conduct themselves, but their first duty is vigilance. Let the priests of the Church of the Light offer consolation. The Arm of Justice is the sword of the heavens and its purpose is to deliver holy wrath, not comfort. The Arm of Justice divides the domains of Lathidus into two groups. The first group, the Virtues of the Sword, are considered appropriate tools that a member should choose as most useful in the fight against evil. The Virtues of the Sword are the domains of Exorcism*, Inquisition*, Judgement, Summoning*, Sun, and War. The remaining domains are given a passing nod and are called the Virtues of the Staff. These domains are best held by the priests of other factions whose duty is to guard and uplift the lesser masses of commoners. The Virtues of the Staff are the domains of Glory, Good, Law, Missionary, Protection, and Rulership. Members of the Arm of Justice are not as concerned with public demonstrations of faith as other Lathidus worshiping factions are. Most of them are of the opinion that if you are living everyday in meaningful worship that there isn't a need for special days or demonstration since every day is holy. Still, there are a number of observances and traditions that its members keep. There are also a substantial amount of symbols and secretive actions which members regularly make subtle use of. These are used to identify each other in communities where the Arm of Justice is not welcome. Crusaders of the Arm of Justice only wear special garb on days of special significance. Most of the time they wear light or heavy armor, depending on how much trouble they are expecting. One constant of their costume is the sword, the favored weapon of an Arm of Justice, which they constantly keep at their side. Holy symbols of any of the other branches are suitable for use by a member of the Arm of Justice, they have no special holy symbol of their own order which to present against evil. The symbols of the Church of the Light are often used since the Arm of Justice was founded by a former member of that branch of faith. Thus, the Orb of Radiance and the Holy Face of Light are common symbols carried. Members often bear a tattoo of a severed arm carrying a sword or a sword piercing a writhing serpent. The former represents the vow of a member that "should my arm deal in evil I would sooner sever it from my body than suffer its taint upon me." One of the secret symbols used to identify each other is based off this design: a square balanced on one corner, with the top left side missing. The lower two lines of the square representing an arm and the upper stroke resembling a sword. 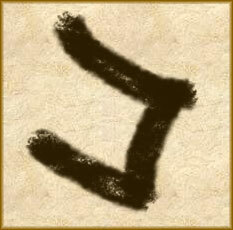 Most members have this symbol or its likeness somewhere on their person that can be easily hidden. The symbolic head of the Arm of Justice is the Lord Patriarch of the Church of the Light, but for many members of this branch of worshipers their true allegiance is to their Holy Commander, the highest ranking paladin in the Arm of Justice. The Holy Commander has traditionally also been a member in good standing within the Church of the Light, though they often have a reputation as an independent thinker and as an action taker because of the fervor with which they combat corruption. This Holy Commander is chosen in a contest of arms and also by nomination from the seven Enlightened Generals. He (there has never yet been a woman Holy Commander) is responsible for directing the order against its greatest foe. Members of the Arm of Justice believe that their Holy Commander listens directly to the will of Lathidus and thus knows the truth of where the Arm should direct its efforts and how to best weaken its enemy. The Holy Commander raises up new Enlightened Generals and approves each captain appointment. Just beneath the Holy Commander are the Enlightened Counsel of Generals. These are paladins and priests who have proven their dedication to the Arm's cause and who have also demonstrated great valor and prowess in battle. There are seven such Enlightened Generals, positioned throughout the regions which the Arm of Justice occupies. In absence of the Holy Commander they speak with complete authority. The seconds of the Enlightened Counsel are the Blessed Champions, who nearly command the same power except for when nominating a Holy Commander. Enlightened Generals are appointed from among the Blessed by the reigning Holy Commander after a sign of divine confirmation becomes known. Such a sign might be the appearance of a divine herald of Lathidus, a divine blessing, or the display of a miracle at the hands of the Blessed. When a space becomes available among the Enlightened Counsel, either through a death or retirement, the remaining counsel members confirm the sign of Lathidus's favor upon one of the Blessed that they choose and with the good graces of the Holy Commander a new Enlightened is elevated. Each of the Enlightened and Blessed watch over numerous captains. Captains are the most visible members of the Arm of Justice because they lead the units which typically get things done. There are many captains, each leading teams twenty or so men with the assistance of two or more sergeants, forming strike teams which gather in brotherhood and remain vigilant, ready to be called into action. Captains can be priests, but usually they are paladins or zealously religious fighters and rangers. Beneath the sergeants and captains are the rest of the holy legion. These are warriors, priests, guardsmen, scouts, and other friends of the Arm of Justice who offer their homes as shelter, and everyone else who supports their cause. Among the most exemplary members of the Arm of Justice it is difficult to tell whether they are more lawful than good or vice versa. It is important to have equal measures of both. Often members of the Arm of Justice find themselves working outside the limits of the law because evil has taken shelter within the ranks of law abiding people. Yet, members of the Arm of Justice are held to a rigorous set of oaths, abide by a strict organization within their branch of faith, and really are encouraged to follow the law when possible. Most members of the Arm justify their breaking of local laws by saying that unrepentant evil beings have forfeit their right to lawful protections and therefore it is open-season on evil creatures. Much of the Arm of Justice uses the same laws and guidelines as the Church of the Light. They read from the same Holy Tripolite texts and they take many of the same minor, sacred, and mortal vows. Most also adhere to a code of chivalry as best as their convictions allow them to and many members also swear oaths due to their special status as paladins. Further, the Arm of Justice requires its members to make several other vows in addition to all of the above. Members take all of this lawful oath making in stride, believing that it fortifies them against temptation, prevents misunderstandings within the order, and helps everyone get along. Most members are loath to even consider breaking a minor vow. Higher ranking members hold themselves to even loftier ideals, but sometimes they are forced to bend on their strict principles since in many parts of the world the Arm of Justice is not welcome by those who are in power. Minor vows are also designed to help a member of the Arm of Justice reconcile any differences they might have with the law of the greater worshiping body of Lathidus. Members of the Arm of Justice keep a minor vow of cleanliness which require them to maintain their armor, weapons, and tools respectfully clean. They are realistic about this vow. On a long campaign trail or after a pitched battle things are going to get dirty, but an Arm of Justice troop is noticeably cleaner and more polished than any other military command. Reasons for this go beyond respecting their weapons; it also helps keep away disease and it discourages the oft stereotype that members are brutish thugs of good alignment. A vow of abstinence from mental state altering activities, such as imbibing alcohol, use of drugs, and application of emotion altering magic is also required of members of the Arm of Justice. This minor vow is required of active members in the holy legion, but it is often loosely applied to friends of the church who do not actively campaign within an Arm of Justice troop. Members do not believe that such substances are evil when used with consent, but they believe that by partaking them that it weakens a man's standards of goodness and makes them vulnerable to evil influence. Sacred vows strictly lay out under what circumstances a member of the Arm of Justice can fraternize with questionably aligned men. The Arm of Justice does not look at evangelism as primary to its purpose; such things are better left to the Church of the Light and "softer" do-gooders. Commingling with known evil beings and knowingly engaging in commerce with such people is strictly forbidden. Basic tenants of mortal vows remain the same for members of the Arm of Justice as it is for all other branches of Lathidus worshipers. Members must refrain from blasphemy, corruption of sacred items, sacricide, compromising one's soul to beings other than Lathidus, and the making of oaths or taking of employment in the service of beings opposed to the will of Lathidus. Venitence occurs on the longest day of the year and the two days preceding it. This is when members renew their vows to their god and to the Arm of Justice. Though a rare occasion, members often use this day to announce their retirement from the Arm of Justice. Most go on to serve in other branches of the faith, from where they pass on information to their friends that are still full-time members. On the two days preceding the longest day of the year, members sheath their weapons for the first two days and spend most of their time at rest. On Venitence Day they renew their vows, wear white as a symbol of purity, keep their weapons unsheathed, and ritualistically cut a shallow slice into the flesh of each of their hands as a sign of the sacrifice they are willing to make for their god. Firmass, also called Burning Day, is on the shortest day of the year. The evening of this solemn day is spent building fires into which they cast objects which are sentimental in value to them. Donations to charitable causes are also common. The purpose of this tradition is to remind worshipers that there is a greater purpose to life than emotional attachments and temporary treasures. Members wear red somewhere upon their person on this day and tell heroic tales of friends and legends who made the ultimate sacrifice for their god. The Day of Rising is celebrated during the vernal equinox. New members are officially inducted into the Arm of Justice on this day. These inductions are fairly small and secretive affairs where the new member formally repeats their vows, is assigned an elder that they will travel with and who will mentor them, and where various secret signs are taught so that the new member can find their way to safety and identify other members and friends of the Arm of Justice should they be in need. Sir Setivus Van designated this day to this purpose so that new members have the benefit of older members wisdom and leadership until at least the summer solstice. Since the Arm of Justice often operates outside of the law to accomplish its means this means that a great deal of the sects action in the community is concealed from the public eye. Still, even covertly, the Arm of Justice must interact with communities since they are a part of what the Arm of Justice believes it is its duty to protect. Members of the Arm of Justice keep a careful eye on the community they work near not just to root out evil, but to find potential recruits. Prospective members are contacted by a recruiter who does not tell them of the order. Instead, the recruiter works at becoming a confident in order to determine the prospective's character and integrity. Should a good match be made and the recruit seems like the kind of person that would fit into the order than introductions are made. If they continue to be receptive then their training begins under the guidance of one or more senior members until the Day of Rising, when they are entrusted as full members within the order. Members of the Arm come from many walks of life, but most members are more than passingly familiar with the use of a weapon or quickly become capable of wielding one through training with another member. A healthy number of members already work within the community as city guards, temple guards at a Church of the Light, mercenaries, local woodsmen who are familiar with the land and the evil dangers that prowl the hills at night, or craftsmen who must physically labor for their livelihood. Few women join the Arm, but those that do are as tough as nails and are completely devoted to the battle that is waged against evil. Through their members, the Arm wages a subtle war against evil. Members who are guards return to their unit and pass on information of where a thieves guild is operating; if the city guard should prove unable to take care of the problem then the Arm of Justice takes matters into their own hands. While governments and self-righteous people frequently dislike the brazen vigilantism of the Arm, common folk who fear evil and depend on the shelter of good often admire and silently support them with shelter from local authorities, meeting places in their basements, provisions for the campaign trail when a long journey awaits, and tips about corruption within the community. Most members of the Arm of Justice worship in the temples of other sects, such as in the Church of the Light. In this way, they keep in touch with the pulse of the faith. Some members of the Arm are even preachers and important members of the church with broad access to the gossip and confessions of the community or with influence over members of the local government. When a temple of another acceptable sect is not available and when the setting is too hostile for its members to erect their own temple then secret services are held in barns, empty warehouses, basements, in the woods, or wherever is available. Actual temples of the Arm of Justice tend to be simple buildings that are clearly designed not just for worship, but also with a military use in mind. They are well provisioned, well guarded, carefully positioned, and easily defendable should the powers of evil decide to openly assault one. Temples are never left unguarded, lest their sacraments become defiled. Some temples of the Arm of Justice masquerade as non-denominational worship centers of Lathidus and set up shop in military cities. These temples are often among the best recruiting centers. A Brotherhood of paladins dedicated to the defense of good and the redemption of evil. These martial servants of Lathidus originated in the southern lands of the Eastern Empire and have since spread westward as far as the Confederacy of Zhakar. Besides the Church of the Light, the Golden Order is one of the more populous and popular sects of Lathidus worshipers. In AC12866, during the time of the Black Scourge, a paladin of Harushta called Andal of Storwen traveled to the hideaway of his secretive order. The Golden Order was a dwindling group of paladins who headed a resistance movement against the tyrants of the Dark God who now ruled over the Eastern Empire. His message for his order had originally been news of defeat. Their brothers of the resistance in Ardent, the imperial capital, had been discovered by a cadre of Moredwraiths, and destroyed. The Golden Order of Ardent was in disarray and at risk of being entirely wiped out by the Dark God's minions. However, as he traveled on the road to bring news of this tragedy to the order he experienced a miraculous encounter. He spoke of how he was attacked by the undying soldiers of the Dark God. Before he could be captured an angel appeared beside him, in their midst and with wide sweeps of its glowing blade it scattered and slew the evil servitors. No divine being had been seen for many years, but for those of the Dark God, so when the paladin saw that his warrior saviour was an angel he fell to his knees. The angel bid him rise and as he did there appeared around him eleven brothers of the Golden Order who had been slain in Ardent that morning. The angel gave the paladin a commission and told him that the gods had broken their silence, that Harushta had been reborn to a new age and had taken the name Lathidus, and that he was to take word to the brothers of his order. With a touch of its wing, Andal of Storwen felt divine and holy energy suffuse him and the return of his paladin abilities which had been absent for six long years. Andal returned to his order at their secret refuge and witnessed to them what he had seen. As a demonstration of his truths he blessed them and again there appeared among them the angel and the eleven who had been martyred doing the work of good. They spoke at length and then the angel told them to go out into the empire, to spread word of the return of the holy powers, and to continue their efforts to overthrow the tyranny of evil. When they were done, the spirits of the slain paladins said that they would be near and guiding them, then in a moment of brilliant light they disappeared. The paladins took these orders to heart and traveled throughout the empire, spreading the word of Lathidus, returning hope to the people of the Eastern Empire, and their work eventually brought down the puppet emperor of the Dark God and scattered its minions to the dark corners of the world. Members of the Golden Order are noble warriors of compassionate good who place equal importance on the advancement of good as on the reduction of evil. Nearly all members of the Golden order are paladins or warrior-clerics. These champions of good root their beliefs in the cleansing power of light. Their light is not as literal as the Church of the Light, but figurative as demonstrated by their mission: To be as light to the world by bringing hope to the hopeless, teaching faith to the faithless, living among the common folk, redeeming evil with mercy and forgiveness before the sword, championing the weak, and by being an example charity and sacrifice. Of all the axioms of this credo, what seems to set the Golden Order apart from other paladins of Lathidus the most are their efforts to redeem evil beings and bring them to a life of good. Unlike some orders of Lathidus, their charity and compassion is not limited to those who try to lead good lives, but it is even offered to those who do evil. It is their belief that the first step on the road to salvation is the offer of forgiveness and demonstration that anyone can be worthy of compassion. Though they are warriors whose duty is to ultimately eradicate evil, few champions of good so consistently offer mercy to their foes as do members of the Golden Order. Members of the Golden Order believe in the reincarnation of the deity Harushta as Lathidus, a reincarnation which does not include the resurrection of other fallen deities of good such as Solten or Prolitar. This often puts them at odds with adherents to the Church of the Light. Instead, Lathidus is accompanied by a host of angels and saints. Angels, called Eternals, transcend the resurrection of Lathidus, while saints are divided into Antitenebrants and the Luminaries. Antitenebrants were saints of Harushta before the Black Scourge, whose spirits transcended sainthood and joined with the essence of Lathidus at its birth. Luminaries are saints who have risen into the heavens since the rebirth of Lathidus, primarily seen as the eleven martyrs whose spirits appeared before Andal and the first Apostles of the Golden Order. Members of the Golden Order believe that each of these Luminary Saints represent a different aspect of Lathidus and that they channel the holiness of these beings as they do their good works. Although they pray to Lathidus, it is the expectation that the spirit of their deity on Sulerin acts through these saints who then inspire members of the Golden Order to action. Members of the Golden Order emulate this transcendence in turn by trying to inspire mortals with their own holiness and spirituality. Ultimately, the souls of those who die while members of the Golden Order live on, immortal, as scions of the saints and join the holy choir of Lathidus as a growing body of good in the heavens, immutable in its stand against the powers of evil. It is believed that some rare few champions of the order may even ascend to sainthood themselves. Since many adherents of the Golden Order are paladins, choice of divine domain is usually a non-issue. However as the order matures and supporting priests who can channel the power of Lathidus are added to its ranks the Luminary Saints inspire many to choose domains of Good, Missionary, Protection, Sun, and Law. By far the most common choice is the domain of Good, which aids the priest in their exigent battle against the powers of evil. To compliment this domain, many priests then choose one of the latter which allows them to serve the needs of those on whose behalf they fight evil. Many choose the domain of Missionary to aid them in their quest to redeem evil. Less evangelistic priests choose the domain of protection and employ its use to fulfill the orders commandment to champion the weak. Those who choose the domain of Sun often speak of how they seek to be closer to the inner light of the Luminary Saints in a literal sense, not unlike the Church of the Light but for what the credit the symbolism of their light to represent. Finally, a rare few choose the domain of Law; these priests employ their powers not just to organize the faithful, but to empower servants of good to become good rulers of the people in place of those who would abuse the law for their own advancement. Though young, the Golden Order has a variety of traditions already established. Though its business as it works alongside the people of the world is often less formal and marked by the trappings of symbolism, some occasions demand that its members be able to identify each other while others, such as the promotion of a member within its ranks, are deserving of pomp and fanfare. In the line of duty, members of the Golden Order are frequently armored as they pursue the dangerous business of acting to bring change in lands plagued by forces of evil. In these situations it is not always best to announce oneself as a champion of good and sometimes subtlety is the better course of action. In less polarized regions, where it is safe to be a member of the order, its adherents paint or gild with gold a ring about the circumference of their helmet's brow. A golden shield on the breast over the heart is another common symbol, as is painting ones shield gold and with the blazon of a sun bisected by a sword. In more formal situations, a white raiment of cloth draped over fine ceremonial armor, with rank indicated by the length of a fine mantle of gold cloth is about as formal as their dress becomes. In a break with the Church of the Light, members of the Golden Order use the longsword (or any sword that can be used one-handed with a shield in the other) as their favored weapon. These weapons are often decorated with prayers, vows of mercy, and similar lettering. Swords given to paladins often have a golden pommel, chappe, and golden shield-shaped locket on the scabbard, besides numerous other religious symbology common to faiths of Lathidus. The swords of warrior-priests are only slightly less ornamented, but all swords crafted for the Golden Order are extremely functional and not intended to be merely decorative accessories. As previously mentioned, the sign of the Golden Order is a gold-lined shield emblazoned with a gold, eleven pointed sunburst that is bisected by a sword as though it shown from behind the weapon. Here, the shield represents protecting that which is close to the faith, those who cannot protect themselves. The sword is in the foreground as the weapon of the faith used to deal with unrepentant evil, but it is guided by the figurative light and spirit of the faith, the eleven Luminary Saints who guide the actions of the Golden Order and determine when it is best to use the sword or to use the shield. It also places the influence of the saints at the center of a warriors lifestyle and invokes their power of intervention foremost over the corporeal nature of the shield. Likewise, represented here is the notion that the warriors of the church stand before those who need to be protected, thus the sword in front of the shield. Likewise identified here is the hidden symbology that while there are eleven radiant spikes of the sunburst which represent the saints, the sword forms the twelfth and strongest spike, representing the divinity of Lathidus which rules over the entire symbol. Besides these signs of the Golden Order faith, a variety of hymns have been written to honor the saints of Lathidus, to promote the virtues of the Golden Order, and to tell the stories of victories which it has accomplished. Likewise, invocations such as, "May the eleven guide you," are common among its members. The Golden Order is also fond of the anointing with holy oils when bestowing blessings, representing how the first among their number were blessed by the angel of Lathidus. Being such a young faith, the Golden Order has only a few special days of observation. The second of Silusa, Annunciation Day, is the day on which the angel of Lathidus brought its good news to the first members of the order. Rest, renewal of vows, and readings from the Book of Order, a tome which relates the teachings of the angel on that first day, are activities typical of Annunciation Day. Ending Day, the 6th of Mordun is the day when, in AC12860, the gods ceased to answer the prayers of mortals, even as the terror of the Black Scourge of the Dark God descended over the world. The Golden Order does not treat this day with sadness or tribulation, but instead they observe this day by resolving and forgiving grievances that they may have been holding. Messages or symbols of their grievances are written on paper and tossed into fires. On the day following Ending day, no fires are lit and food is consumed cold, representing the world without the warmth of the good gods. Victory Day, the 23rd of Corvere, is the day in the dead of Winter on which the people of the Eastern Empire deposed the viceroy of the Dark God, Keftuul the Shard. It is a day of celebration and feasting during the darkest time of winter. In the wake of the disappearance of The Twenty, the spiritual silence of the heavens which followed, and the arrival of the reincarnation of Harushta in the form of Lathidus, a great deal of turmoil rocked the leadership of the old church. In the times that followed, many leaders were conflicted, some joining the Church of the Light, the Golden Order, and a lesser few raising the inquisitorial People's Guard sect. Many of the most powerful leaders became part of the Church of the Light, but a significant number protested the three-in-one origin of divinity that the Church of the Light holds to. Most of these priests became the backbone of the Golden Order, giving substance to what was a very rag-tag and loosely organized resistance mostly populated by paladins of Harushta. Along with their zeal, talents at organization, vast connections among the community, and ability to teach doctrine to the common man, priests also gave important legitimacy to the Golden Order, without which they would probably be little more than a rebel band in conflict with the Church of the Light. Although the Golden Order is an order dedicated largely to militant action, its priests welcome this shift to proactive action from the constancy of the old church. Although much smaller than the Church of the Light, the Golden Order has as more paladins among its numbers than the larger sect. Even though some stagnation and bureaucracy of the old church was inherited by the Golden Order, the progressive nature of its founders and its religion doctrine have kept the Golden Order from becoming just another reformed church of Harushta. The head of the Golden Order is the Holy Commander, a paladin and scholar, often senior in age but not venerable and unable to defend their self. The Holy Commander is a member of the Holy Circle, which includes ten Holy Spars. These are retired paladins, warrior-priests, and former high priests of Harushta. They appoint stewards over each established diocese of the church, arbitrate disputes, mete out acts of absolution and penance when necessary, and essentially charter the future of the Golden Order. Each has a vote in the decisions of the Holy Circle; the Holy Commander's vote being the same as a Holy Spar, but the Holy Commander is typically someone of such great respect that their opinion often influences other votes within the circle. High Priests rule over each diocese, answering only to the Golden order and its special appointees, and from there the order of the church greatly resembles many others. Each High Priest administers several Cannons who in turn look over the affairs of a particular town. Individual churches are led by priests. This support network largely exists to spread the social agenda of the church and to support its martial endeavors in its struggle against the powers of evil. Paladins and warrior-priests typically answer first to whomever issued their orders, which is typically a member of the High Priests, but occasionally orders arrive directly from the Holy Spars. Paladins and traveling priests have local church authority similar to a priest who leads a temple, unless they carry special directions indicating otherwise or they have been given a Martial status. A paladin who has been awarded the status of Canon Martial, has roughly the same authority as a Canon, a High Martial has the same status as a High Priest. Traveling paladins and priests typically defer to the recommendations of their less martial, complimentary members of the Golden Order, although nothing requires them to do so but as a courtesy to those who might know the area that they work in better than themselves. Likewise, they typically compromise with and work alongside whichever church leader has the most local jurisdiction in a town or area. This means of organization has proved agile and served the Golden Order well. Though Lathidus is known as a deity of law, the Golden Order has surprisingly few laws of its own. It's members are expected to follow the laws of the communities in which they work, as long as those laws do not contradict the commands handed down by the angel of Lathidus. These commands are as follows. Be as a light to the world, the actions of the Golden Order should be witness of the holiness of Lathidus and the presence of good in the world. Bring hope to the hopeless by giving them something to believe in and by leading them from oppression. Bring faith to the faithless by sharing the teachings of Lathidus and the Luminary Saints. Live among the common folk so as to not lose sight of the plight of the masses. Offer mercy and honor its request from those who desire it, do this before ending evil by the sword. Champion the weak so that their good works might prosper. Be an example of charity and sacrifice as all that is given is done so by the will of Lathidus so that the needs of the people can be met. Members of the Golden Order are encouraged to live up to these ideals as much as they are able to. Those who are gifted with the spiritual ability to follow these tenants most closely are risen as leaders among the Golden Order. Those who fail in these laws are chastised but still welcomed as brothers. Only those who fall from grace and become corrupted with evil are stripped of their rank, yet even they can be redeemed if proper penitence is performed. While the Church of the Light believes in intercessional prayer, the Golden Order believes that the Luminary Saints, and thus Lathidus, is present wherever prayers are spoken, even those spoken by the common folk. Ideally, adherents of the Golden Order are as living prayers to their god in both word and deed, but still there are times of day, such as before meals, at dawn, and before sleeping when they take particular pause to center their spirit with prayer. Any who are with them during these times are invited to participate. Communities which are centered around temples of the Golden Order often echo with the sounds of bells chiming at these regular times. On social issues the Golden Order is progressive and an active advocate of social and political reform, a stance which occasionally makes them unpopular with the ruling class, even though the Golden Order is a staunch supporter of rulers act within the law and lead their people through good acts and compassion. As a part of this progressive stance, the Golden Order favors equality among men. This means that they promote wealth sharing between the rich and the poor, fair opportunity for each genders, and tolerant mutual negotiation between races and factions. This is a reflection of their belief that in the eyes of Lathidus, everyone is found wanting of holiness in their lives; even the most pious priest has faults in their character. In the opinion of the Golden Order, this makes it even more important that their members act in groups and maintain close ties to communities, for it is the strength of a good community which guards even the most pious men against the corruption of evil. Members live lives of moderation and generosity, giving what they do not require for their mission of good to those who are in need. This charitable attitude extends to the faithless, derelict and even to men who hold evil in their hearts, an open-door policy which says that all penitent are welcome in the body of the church. They act to reduce poverty, to increase self-respect, faithfulness, law and honor. While they engage in celebration and do not discourage drunken revelry, paladins and priests tend to refrain from acts which would reduce their effectiveness should the need to defend with sword against evil arose. In their service to the community, paladins are focused defenders, often working at both the fringes of civilization to opposing dangers which prey on the weak as well as working within cities against criminals and politicians who do much the same as predators in the wilderness. Though they are typically compassionate spiritualists, they realize that their training ideally suits them for when the sword must be taken up. Priests of the Golden Order tend to lead more balanced lives and offer services of marriage, healing, shelter, education, and frequently preside over life events such as births, funerals, and traditions of passage into adulthood. Most members of the Golden Order are paladins or warrior clerics, with but a small cast of supporting squires and assistants. Despite this relatively exclusive membership, they enjoy tremendous support of the public for their role in overthrowing regimes of evil and for their tireless charity and self-sacrifice in service to the common folk. These simple, yet beautiful structures of stone are often designed as circles of eleven columns with an unceasing, magically burning golden pillar set in its center. The symbolism is clear, the Luminary Saints given light by the central pillar of the faith, the deity Lathidus. Concentric benches surround these naves. Often the entire affair is sheltered by a large building, though the central pillar is typically not covered by the ceiling and is exposed to the sky instead. Entrances to the buildings are typically on the east side, to face the sun as it rises and the temples are often open through day and night, attended by a duo or more of local priests. The doors of important temples are often festooned with great gold-gilded shields and commonly decorated with statues of the Luminary Saints, and less commonly with statues of the Antitenebrants. Churches are supported with voluntary tithes from individuals in the community and also with the treasure liberated from evil by its paladins and priests. Temples are located more frequently at older sites of the faith, where the faith of Harushta was strongest. This often causes tension between the Golden Order and adherents of Harushta who deny that Lathidus is the resurrection of their silent god. However, as years pass by and their prayers go unanswered, the number of Harushtites is slowly dwindling. Some conflict also arises between the Golden Order and the Church of the Light since sites once holy to Harushta are also holy to the Church of the Light. Though diplomacy is strongly practiced by both sects of Lathidus worshipers, disagreements clearly run deep and were the two sects less lawful or holy there likely would have been open conflict by now. The most sacred temple of the Golden Order are located at Preae-Lumen, literally the "First Light," a small community of pilgrims and priests that has arisen where it is said the angel of Lathidus first appeared to the paladin Andal of Storwen. It's an impressive building, constructed with many of the building principles outlined above, and able to accommodate the steady stream of tourists and spiritual visitors throughout most of the year, except on Annunciation Day when the crowds are simply too great to hold in any one building. Another important site is the temple at Scaeran Mons, a remote outpost deep in the northern mountains of the Briteland Province and south of Thimhallen. This is where the law of Lathidus was given to the first paladins of the Golden Order. Originals of these texts are said to be kept in a vault there. The temple at Scaeran Mons is an unconventional, heavily fortified military affair, surrounded by training grounds for paladins of the Golden Order and barracks for its many priests. This site was central to the resistance that paladins of Harushta organized against the occupying forces of the Dark God during the time known as the Black Scourge. Fewer pilgrims make the several days journey and arduous climb necessary to reach this temple.